Thinking of buying this or one like it. 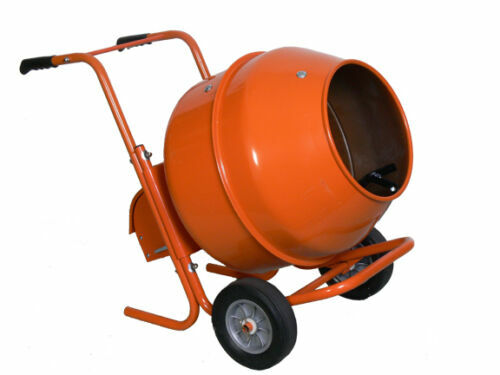 Hoping some of you can give me some heads up on mixers, First question: When they say "5 Cubic ft" mixer are they saying the over all size or the amount of concrete you can mix at one time, second question: how heavy is a load (5 cubic ft?) of concrete that's all mixed with water? Am I slapping myself thinking I could move this mixer fully loaded?, Next, Help me with some math- at 3" thick how far will 5 cubic ft of concrete go ? Brought this home some time ago....I need to measure it. We bought a small HF mixer last summer that was called a 1 1/4 cu ft mixer. That has to be total capacity, as it will only mix 1 40# bag of sand mix at a time, & I think they are 1/2 cu ft, so I would be wary of the 5 ft claim. 150 lb per cubic foot X 5 = 750 pounds. You can do 2 or 3 cu ft at a time, but I don't think it is meant to move full. The ones I have used are higher so you can pour into a wheel borrow. A standard contractors wheelbarrow is 6cu. ft. for reference. 5cu. ft. at 3 inches thick will cover a 4x5 foot area. Might be tough pushing it around on those little narrow wheels. If my math is correct, 5 cu ft would cover 20 Sq ft.